Iran said today it would send its security forces into Pakistan to free kidnapped border guards if Islamabad did not take measures to secure their release. 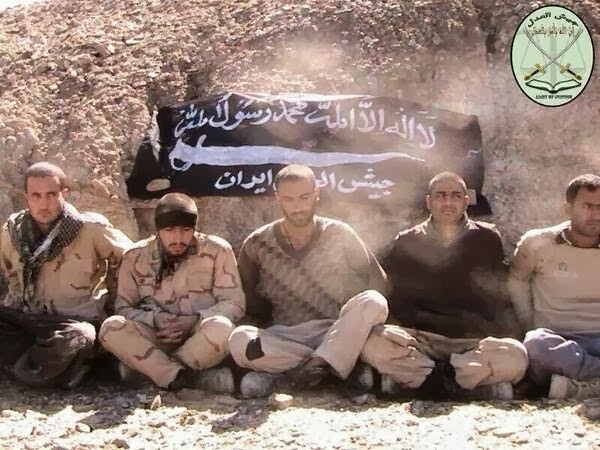 Iranian Baluch militant group Jaish ul-Adl (“Army of Justice”), the apparent successor to Jundallah, on Sunday 9 February took responsibility for kidnapping five Iranian border guards by posting group photos and videos of them on their Twitter account. The group operates on both sides of Iran-Pakistan border in Greater Baluchistan area. LONG LIVE THE BAKHTIARI PEOPLE !! DEATH TO TYRANNY !! LONG LIVE IRAN !! Hostage takers are not Bakhtiaris, they are Baluchis! And whose tyranny? You haven't heard then? The Bakhtiari people were slandered by the regime's media. So they decided to come out and show the tyrannical regime their honour. So no relations to our post on the Baluch militants and Iran's intention to probably send forces across the border. Appreciate it if in future you would limit your comments to the subject of the posts. But the situation here does not resemble the borders and relations between Germany and France. Very well then.Lets say the regime sends forces across the border into Pakistan to clobber the militants with. Then what? It wont solve anything because of the very nature of the Islamic regime,which is anti-Iranian and against human rights. How about Khuzestan Azarbaijan and Kordestan? Across the country there are hangings every day of the week under the pretext of "war against drugs". The regime is at war with Iranians by trying to divide and rule our country. Look at those border guards. They didn't even have proper equipment like armoured cars and ballistic field jackets. I pressume those things are reserved for Khameini and his gang of criminals with their Hezbollah terrorists in Lebanon. The Iran must do same in Pakistan the same as the american with thie drone war. donot be Patient about Pakistan Goverment and kill all those poor poor Pakistiani who donot learn anything except Kidnapping and drug dealing. Well at least you have a much better chance in a armoured car instead of marching on foot with no protection like body armour. Lets see if you would like to walk around the border area without these equipment. Iran's high command must confront these terrorists with brute force. The worst decision they could take is to pay whatever amount of ransom asked for by these militants. I would guess that kidnappings and hostake taking of border guards has been a common occurence and most often their demands were met - release of prisoners or money. Both choices are wrong and only serve to encourage these sort of people to pursue this kind of activity. Iran has the assets/resources needed to effectively deal a devastating blow to this group. If you have what it takes, then go for it. Iran must convince these people that they will be targeted for what they have done. One must threathen the adversary with escalatory measures - next time you do something bad against us, we will hit you even harder. Eventually the weaker side will break, and it is clear that in this military conflict Jaish-Ul-Adl will get far more hurt, because their retaliatory options are very limited. I would say, save these poor kidnapped men by any means possible, but let this be the last time...then strike them mercilessly. Please delete words like bozo and resubmit your comments. The strength of your argument needs not be undermined by personal attack. Uskowi, why don't you delete that racist term? http://www.youtube.com/watch?v=phoatgnlVaU --- First video released by Jaysh Ul-Adl of captured Iranian guards. Put your money where your mouth is and go and patrol the Iran Afghan Pakistan borders without those things and then come and say "nope". Otherwise just be silent because you don't know what you're talking about. guess who is pushing the race card? the man from the dark continent. when it suits him he turns up as BMA, otherwise Anonymous. What a spiteful ahmagh who has no respect for Iranianian people and values. I have come to the same conclusion about this person. these terrorists are backed and financied by Saudi Arabia and Pakistan. iran has every right to pursue and attack these savages where they are. Iran uses the same tactic with the terrorists stationed in Iraq why not with these Eastern terrorists? Only an "ignorant person" would send troops to the Iran Afghan/Pakistan border with nothing to defend themselves with. I take it all IRI groupies are all alike?